Alicia Keys says it best when she describes New York City in the song Empire State of Mind as a “Concrete jungle where dreams are made of / There’s nothing you can’t do /…These streets will make you feel brand new”. For many of the participants of the first careers trek held in New York, both the start of the MBA and the possibility of working in New York are an opportunity to feel brand new. For those such as myself who have already lived and worked in New York, the trek provided a new view of available career paths in a city we thought we already knew! The trek began with a panel composed of seven CJBS and Cambridge alumni who shared their unique career histories both pre and post-degree as well as providing practical advice about navigating the MBA experience. The alumni emphasized utilising CJBS and access to the broader University to expand our personal interests. Whether it be joining a sports team or taking a class in a wholly unfamiliar subject, they advised leveraging the full scope of what the University has to offer. Following the discussion, we headed to dinner in Times Square where we had the chance to mingle in smaller groups with the panelists. The next morning, we set out on our trek to meet with three companies that represent key New York industries: consulting, technology and finance. First, we visited the offices of brand strategy consulting firm Millward Brown Vermeer. Through a series of case studies featuring blue chip names such as AB InBev and Paypal, we learned how Vermeer blends business consulting, brand strategy and proprietary research to drive sales and brand recognition for clients. Afterwards, we headed to the trendy Meatpacking District to visit the sleek new offices of Samsung. Judge alumnus Damon Sununtnasuk presented on the range of Samsung’s activities across industries as varied as shipbuilding and consumer finance. 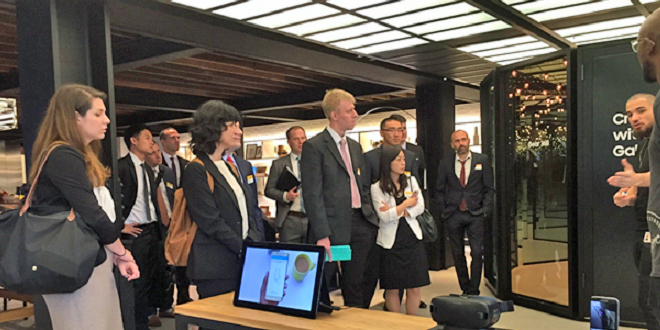 We were also lucky enough to get a guided tour of Samsung 837, a public creative meeting space featuring interactive experiences with Samsung’s latest technologies such as smart appliances and virtual reality headsets. We ended the trek at my alma mater, JPMorgan Chase. Judge alumnus Matt Jenkins provided us with a view into financial technology. Describing banks as technology companies with a banking license, Matt and his colleagues shared with us the reliance banks have on technology to deliver client services and provided insight about how JPMorgan is staying ahead of disruptive technologies such as peer-to-peer payments, digital currencies and blockchain. Reflecting on the New York trek, I can’t think of a better way to have kick-started the year ahead! In one of the world’s great cities, we initiated our Cambridge alumni network with the panelists, laid the foundations for friendships with our new classmates and explored a diverse group of potential employers. As the first trek held in New York, the bar was set high, and I hope that our class raises the bar higher as alumni hosts at an even wider range of firms when the Judge trek returns to New York next year!